The human genome is organized into different levels of complexity. Packaging of DNA into different chromatin states and 3D nuclear organization of the genome are emerging as additional levels of regulation of genome function and integrity. 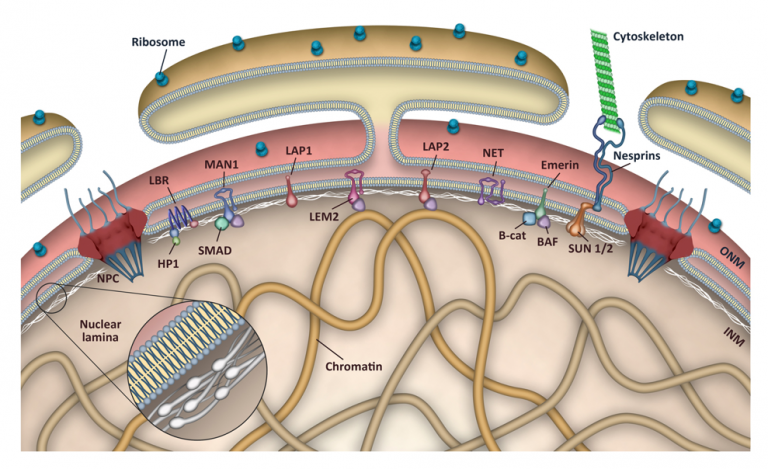 Studying the association of lamins dysfunction with degenerative disorders, premature aging and cancer, and understanding the molecular mechanisms whereby lamins regulate genome stability and function. Research on the molecular mechanisms of genomic instability in HGPS, a premature aging laminopathy, and strategies that ameliorate disease severity. Defining the cause-and-effect relationship between lamins loss and oncogenic mechanisms as well as the role of lamins in anti-tumor immunity and tumor response to immunotherapy. Intriguingly, our studies in cancers with poor prognosis, such as BRCA-mutated and triple negative breast cancers (TNBC), show striking similarities with cellular phenotypes of HGPS patients, including deficiencies in DNA repair/replication and in vitamin D receptor (VDR) signaling. Importantly, we discovered that calcitriol, the most bioactive vitamin D metabolite, greatly improves a variety of phenotypes in cells from breast cancer and HGPS patients. Our long-term goal is to characterize how these pathways contribute to disease in cells in vitro and in animal models in vivo, as well as their potential as targets for treatment of lamins-related diseases.